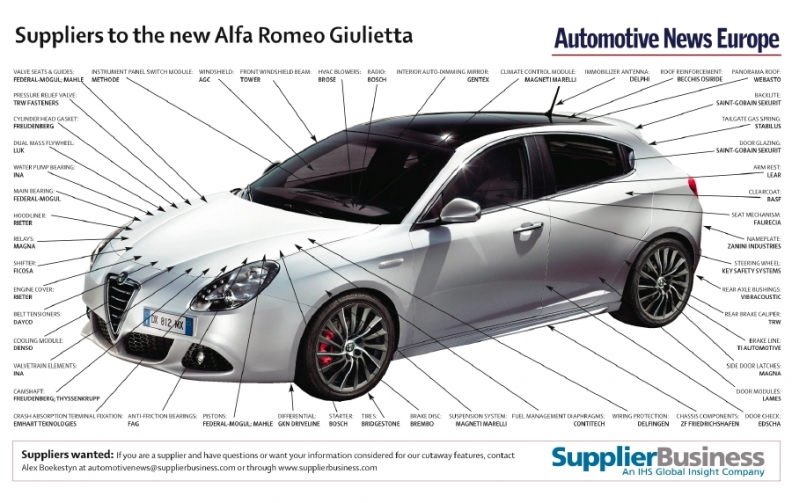 Magneti Marelli S.p.A. improves safety in the new Alfa Romeo Giulietta by supplying xenon headlamps as well as the adaptive front lighting system that adjusts the intensity and diameter of the light beam to suit the direction of the road, weather, visibility and speed. The Italian supplier, which like Alfa Romeo is part of Fiat S.p.A., also provides LED daytime running lights (DRL) and brake lights. Using LEDs requires less energy, which is important when lighting in continual, and engage more quickly than standard bulbs, reducing the risk of rear-end collisions. Other safety suppliers to the car include TRW Automotive Inc., which contributes the passenger side curtain airbag module, rear brake calipers and the seat belts; Key Safety Systems Inc., which delivers the driver airbag and steering wheel; and IEE SA, which provides the seat belt reminder. AGC Automotive, a subsidiary of the Japanese firm Asahi Glass Co. Ltd., was awarded contracts for the Giulietta's windshield and rear window. The windshield is equipped with sound insulation PVB as a standard feature and may be fitted with thermal shielding, reducing the heat entering the car by about 10 percent. Alfa Romeo assembles the Giulietta in Cassino, central Italy. The sporty five-door hatchback starts at 20,300 euros (about $28,725) in its home market.